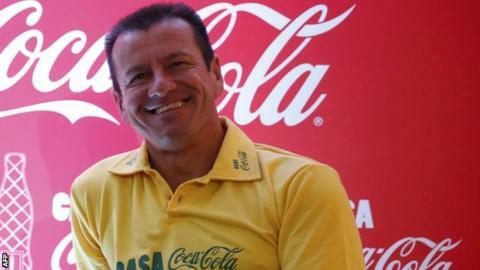 Brazil have named former player Dunga as their new coach for the second time. Dunga was the captain of Brazil's 1994 World Cup-winning team and coached the national team from 2006 to 2010. "I am immensely happy to be back," said the 50-year-old, who was the favourite to land the job. Dunga replaces Luiz Felipe Scolari, who resigned after Brazil suffered the joint-heaviest defeat in their history, losing 7-1 to Germany in the semi-final of the 2014 World Cup. Dunga was in charge at the 2010 World Cup in South Africa when Brazil were knocked out in the quarter-finals. Andrey Lopes - Dunga's number two at Internacional last year - will be Brazil's assistant manager, with 1994 World Cup winners Taffarel and Mauro Silva also part of a 13-strong new-look backroom team. Technical director Gilmar Rinaldi said: "We are calling up players who were world champions so we have that DNA in our team." Scolari, who guided Brazil to World Cup victory in 2002, and his entire backroom staff have all left their posts since the tournament finished. Meanwhile, Argentina coach Alejandro Sabella, 59, will decide his future next week after his side lost 1-0 to Germany in the World Cup final. Members of the squad have said they want Sabella to remain in charge for the 2015 Copa America in Chile. "It's down to whether I feel strong enough to give 100%," said Sabella.